A modern rainwater collection system provides households with a supply of clean water for many uses – from cleaning purposes to filtered drinking water. Rainwater harvesting is an economical way to ensure access to water year around while lowering municipal water bills for individual households. At the same time, this means there is less pressure on public water systems. A harvesting system is an environmentally sound and responsible practice for today’s changing environment. Rainwater harvesting systems, such as these ready to use tanks, provide you with the means of using rainwater during the rainy season allowing the natural and municipal reservoirs to recharge for use during the dry season. * We do not recommend drinking, cooking, or bathing with untreated rainwater water nor giving it to animals as this filtering system does not provide adequate treatment for potable water use of any kind. 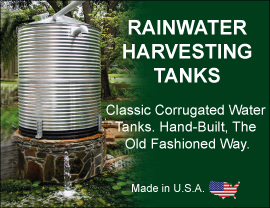 Untreated rainwater is considered non-potable water, water that is not treated to drinking water standards and is not meant for human consumption, but which may still be used for many other purposes such as irrigation.